Paleo Running Momma‘s recipe feels like a cheat meal even though its not!! This is a flavorful, unique paleo meal! One of my husband’s favorites. Peel your sweet potatoes and cut them evenly into “fry shape”. Toss sweet potatoes with the 2 tbsp melted coconut oil or olive oil, salt and pepper in a large bowl to fully coat each fry. Arrange the sweet potatoes on both baking sheets in a single layer. Bake for 25 minutes, turn over as many as you can, and continue to bake for about another 15 minutes. While the fries bake, add the ground meat to a skillet on medium heat. Add the the diced tomatoes and all of the spices (only 1/2 tsp of chipotle powder), plus salt. Stir and cook until the meat is cooked through. Make your spicy aioli by mixing Sriracha, other 1/2 tsp of chipotle powder, vegan mayo & lime juice. 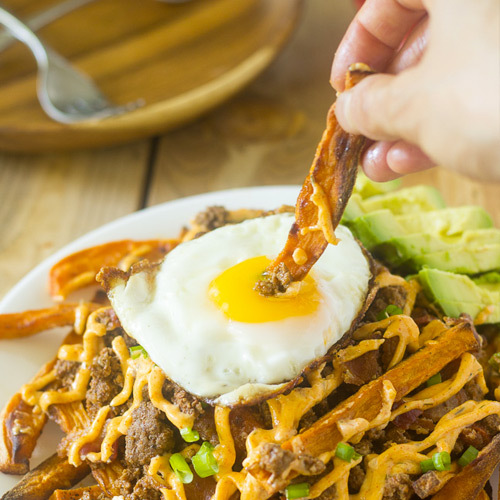 Top the fries with the chili, eggs, and aoli.